“Page had been on the radar of the FBI at least as far back as 2013, when a bureau wiretap caught suspected Russian spies discussing their attempts to recruit him. Even after being interviewed by the investigators in that case, Page continued to have extensive contacts with Russians, including trips to Moscow in July and December 2016.” By Rosalind S. Helderman February 2 The Washington Post. Carter Page has said he was “interested in business” and “possible research opportunities” when he traveled to Moscow and London in December 2016 to meet with Russian contacts. At the time, he was under FBI surveillance. And federal law enforcement officials were apparently concerned enough about the former Trump campaign adviser’s activities that they repeatedly sought to extend their monitoring of Page, according to a Republican House memo released Friday. The controversial GOP memo alleges that the warrant the FBI obtained in October 2016 to track Page relied on unvetted information provided by a former British spy working for the Democrats. While Republicans presented the memo as evidence that the investigation was tainted, the document indicates that law enforcement officials had sufficient worries about the energy consultant that they felt it was necessary to continue to monitor him. Page had been on the radar of the FBI at least as far back as 2013, when a bureau wiretap caught suspected Russian spies discussing their attempts to recruit him. Even after being interviewed by the investigators in that case, Page continued to have extensive contacts with Russians, including trips to Moscow in July and December 2016. It is not clear what the FBI learned about Page’s late-2016 travel abroad, which occurred just weeks after Trump’s election. But five senior Justice Department and FBI officials signed off on three requests for extensions of the foreign intelligence surveillance warrant for Page; all the requests were approved by a federal judge, according to the Republican memo. Page released a statement Friday praising GOP lawmakers for revealing an “unprecedented abuse of process” in their document. To obtain a warrant to monitor a U.S. citizen under the Foreign Intelligence Surveillance Act, the Justice Department must convince a judge that there is probable cause to suspect that the person is an agent of a foreign power and is engaged in criminal conduct. Such warrants expire after 90 days. To receive an extension, the department’s attorneys generally produce new evidence showing the judge that the monitoring has been producing information that advances the investigation. Late last year, Page provided vague and at times contradictory answers about the December 2016 trip to Russia under intense questioning from the House Intelligence Committee. Page also challenged allegations that during his trip to Moscow in July 2016, he had met with Igor Sechin, an ally of Russian President Vladi­mir Putin’s and chief of the energy company Rosneft, and also met with a top Russian government official. The alleged encounters were detailed in reports that former British spy Christopher Steele compiled for a firm working for Democratic candidate Hillary Clinton’s campaign. Page has long denied that he met the men, labeling Steele’s work a “dodgy dossier” that he says has resulted in his persecution by the Department of Justice and the U.S. media. Trump first named the energy consultant as a foreign policy adviser in March 2016 amid a hasty effort by his campaign to beef up its national security credentials. FBI and congressional investigators have scrutinized Page’s role with the campaign and his contacts with Russians during that period as part of the probes into Russia’s meddling in the 2016 election. But law enforcement interest in Page dates to at least 2013, when the FBI caught two accused Russian spies on a wiretap discussing their attempts to recruit Page and use him to learn inside information about the U.S. energy industry. Page has acknowledged communicating with one of the men — who the FBI later said was a Russian intelligence officer posing as a diplomat — including providing him documents about the energy business. In a transcript submitted in court documents in 2015 after three New York-based Russians were charged with working as foreign agents, the two men discussed Page’s frequent travel to Moscow and his apparent eagerness to help them. They suggested that they were duping the American. “It’s obvious he wants to earn a lot of money,” Victor Podobnyy — who, acting as an attache in Russia’s mission to the United Nations — told his colleague, according to the transcript. “I think he is an idiot,” added Podobnyy, who was charged but not prosecuted because he was no longer living in the United States. 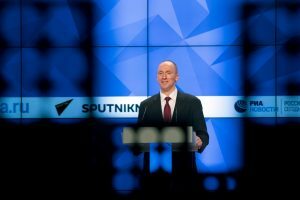 Page has said he was interviewed voluntarily by the FBI in the case in June 2013 and that he gave Podobnyy only nonsensitive information — similar to course materials from a class he was teaching at the time at New York University. He was not charged with a crime. In late 2015, less than a year after the Russian spy case was filed in court, Page approached Ed Cox, the chairman of the Republican Party for New York state and asked to be connected with Trump’s campaign, according to Page’s testimony to the House Intelligence Committee. He knew Cox through New York social circles and said he had long admired Trump and wanted to work with his campaign, in part because he was impressed with Trump’s “new approaches” to the U.S.-Russia relationship, Page told the committee. Cox introduced Page to Corey Lewandowski, at the time Trump’s campaign manager, who in turn introduced him to the campaign’s national chairman, Sam Clovis. It was Clovis who included Page on a list of campaign advisers read aloud by Trump during a meeting with The Washington Post editorial board in March 2016, as The Post previously reported. The list was produced at a time when Trump was rising in the polls and was under pressure to show he had experienced foreign policy hands advising his effort, which was opposed by many establishment national security experts. People familiar with the campaign’s vetting of Page have told The Post that it consisted of a quick Google search, which revealed only that he offered a good résumé: He was a graduate of the Naval Academy, head of his own energy investment firm and held graduate degrees from NYU and the University of London. Page quickly drew scrutiny from foreign policy experts concerned about Trump’s friendly stance toward Putin, a position that was out of step with the rest of the Republican Party. Days after he was named to the campaign, Page gave an interview to Bloomberg News in which he predicted that a Trump victory would be financially useful for Russian associates who had been hurt by U.S. sanctions. “There’s a lot of excitement in terms of the possibilities for creating a better situation,” he said. Then, in July, he traveled to Russia, where he delivered a speech at Moscow’s New Economic School, where he publicly criticized U.S. foreign policy. It was on this trip, Steele alleged, that Page met with top Russian officials, indicating that Sechin had offered Page and other Trump associates a hefty brokerage fee from the impending sale of Rosneft if they could ensure U.S. sanctions were lifted by a Trump administration. Page told the House committee that he did not meet with Rosneft chief Sechin on that trip. However, he said, he did briefly greet Russian Deputy Prime Minister Arkady Dvorkovich after the speech and also said he visited a Moscow bar and watched a soccer match with Andrey Baranov, a top Rosneft executive. Page also told the committee that he was in London for an energy conference either before or after his December 2016 trip to Moscow, staying for something between one and five nights at a hotel that he could not remember. In London, Page said, he had held meetings with a Russian member of his firm’s advisory board named Sergey Yatsenko, who arranged for him also to meet to discuss business with the Kazakh ambassador to Britain.